Wait in what way was a Trump a "decorated civil rights activist?" are you a white nationalist? maybe, I am. if there is a good labor day sale, I like to buy a lot of white pillow cases! In reference to your first point, are you at least willing to acknowledge that there's a lot of ground between nationalism and full blown globalism? You seem to suggest that if you're not pushing complete globalization, you must be a nationalist. Can't really agree with that. yes yes acknowledged--it's all a matter of degree. My feeling is Pat Buchanan and maybe Rand Paul are too isolationist for my taste. So, really my concern is to push back from what I think is happening where a person who happens to look white who might also disagree with globalism and likes the "America First" message from being automatically assigned to the skinhead white pride thing. This guy's white .... he must be a White Nationalist! You're a sane person from what I can tell--for this I'll show some of what got me on this. What got me here was in part the exchange between Lieu and Candace. Notice ole gurl is easy on the eyes as well. There he is standing alongside Ali and Parks. 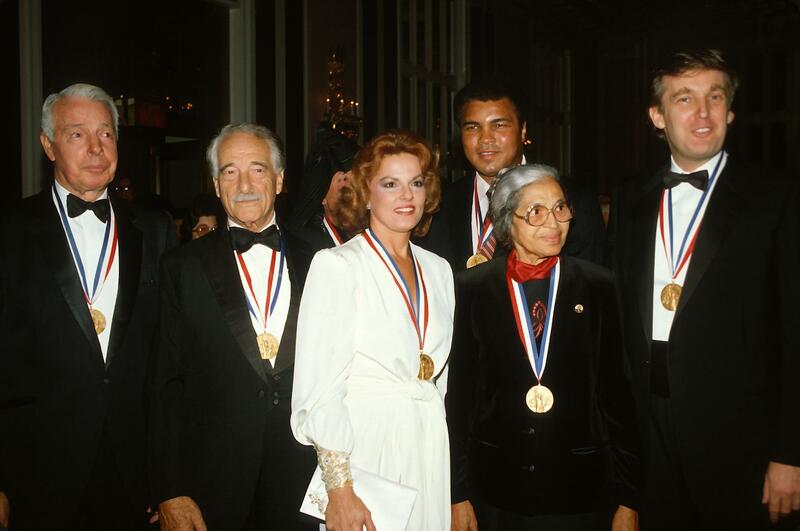 Maybe I should scale back that claim to state that Trump was given an award for his contribution to civil rights. I look white and I'm a patriot. For some, that's all that's needed to lump me in with Xenophobic/inhospitable merycans. So why hasn't he bragged and tweeted about this? Or is it too long ago that it doesn't matter and "That's not who he is today"
The economy is okay and jobs are okay. We need to focus on something to keep everyone riled up. How bad would it be if we were all . . . just . . . happy? Too much of a request I suppose. The economy and jobs numbers started getting better in late 2009/early 2010... I wonder how Trump pulled that one off... 7 years before he took office. I'm betting he has a time machine. Well, we agree that identity politics is a dead end road. And that includes white identity politics. So what do you do if someone tries to get you to play the identity politics game? When I am taking a position on something that paints me in a somewhat conservative light, which happens some of the time, and I am accused of being racist or some other term du jour for my position, which 100% of the time has nothing to do with race, the proper answer is "No, I'm not a racist and actually you're kind of being an a*****e for calling me that without a solid reasoning to do so." Then move on. Either the person will drop the accusation and you can have an actual discussion (which usually doesn't happen) or you can safely assume that reasoned discussion is not possible and move on to someone else. For the record, no, I am not a nationalist. The attitude of extreme nationalism leads to death for a lot of people who probably haven't done anything wrong along with a sense of accomplishment or entitlement for a lot of people who probably haven't done anything to earn it. I can't philosophically condone either of those things. I am not a proponent of full scale globalization. I believe in a level of globalism in terms of mutual economic health and shared resources in exigent circumstances (pooling resources to aid other countries in times of disaster, etc). I do not believe in a one world government or in border dissolution, but those are pretty extreme views that I don't believe many people actually espouse. Like most people, I'll say probably the majority, I fall somewhere in the middle. I am familiar with Red Pill Black. Interesting woman. That's the crux of it for me though. You can be patriotic and not have an "America first" attitude, can't you? I guess the "America first" phrasing conjures images for me of placing things like economic gain for America over the suffering of humans for other countries. Colonialism in the derogatory sense of the word, in the sense of creating benefit for only the occupying country and f*** all else...don't worry about any bodies left in the wake. What is so evil about globalism anyways? I thought alliances against a common enemy are a good thing? NATO? The fight against world hunger? Humanitarian aid? Climate change pacts? Working towards the common good? It’s a global economy whether we want it or not. We suffer in fact if we isolate ourselves or try to fight wars that only serve ourselves. Globalism was cool when it was started as Republican thing by Reagan & Bush #1. It was even OK when Clinton (Bill) supported it, because it had been a Republican idea. It was still acceptable when Bush #2 was in office. And then came Hillary....... And we all realized that globalism was really a deep state plot to destroy Donald Trump. Trump has proven that globalism means... something.... that is.... a.... super bad.... and he is going to tell us why... next Tuesday.